After spending a week in Tokyo, I took a flight out of Haneda to Hong Kong for an extended personal trip. Since the flight (NH859) out of Haneda Airport was scheduled to depart at 8:55AM, I had to leave the amazing Conrad Tokyo at around 6:30AM in order to make it in time for my flight. The earliest airport limousine bus that connects the Conrad Tokyo to the Haneda Airport was not yet in service so I essentially had two options to get to the airport: a really expensive taxi ride or a direct train from a metro station nearby. I decided to go with the latter and I go to the Haneda Airport International Terminal within 30 minutes. Upon arriving at the Haneda Airport International Terminal, I made a beeline for the Business Class check-in counter and the bags were promptly tagged with priority tags and I received my boarding pass shortly after. While I do have access to the ANA Lounge for being a Star Alliance Gold member, traveling on Business Class will give you the same privilege as well. Since I got to the ANA Lounge at approximately 7:30AM, breakfast was still being served - breakfast is usually the least impressive meal service in airport lounges and on-board premium cabins. I will cover the ANA Lounge in a separate post but since the lounge was located really close to the boarding gate, I got to enjoy it to the fullest extent. The NH859 flight from Haneda to Hong Kong was operated on a Boeing 787-900 Dreamliner which is famous for her improved humidity conditions and impressive cabin space. ANA generally operates a different 787 for domestic flights but the one that is used for international and long-haul flights have a 1-2-1 Business cabin configuration. This aircraft features 48 Business Class seats that can be converted into a fully-flat bed. 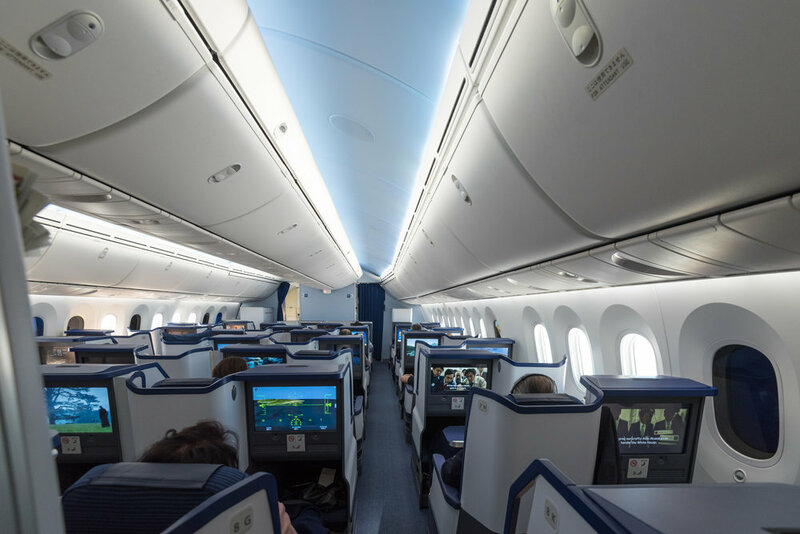 All the seats on the Business Cabin are in a staggered formation and they all have direct aisle-access which means that you do not have to worry about disturbing (or getting disturbed by) another passenger. If you travel on Singapore Airlines quite a bit, the first thing you will notice with ANA's Business Class product on the 787-900 is the much smaller seat width. On my latest flight report on the Singapore Airlines 777-300ER, the seat width was 34 but the seat width on this ANA flight was only 21 which is almost 40% narrower! In fact, the seat width reminds me more of a Premium Economy product than a Business Class one. With that being said, you do get a much-improved seat pitch on-board the 787-900 in Business. With a seat pitch of 62, you can be sure that the converted flatbed will give you the space you need for a good rest. Each one of the seats in the Business Cabin features a really large table by the side (some of the middle seats offer two large tables!) where you can place your small personal belongings on. There is also a small storage space under the seat in front of you (or more specifically, under the ottoman) for your personal belongings - otherwise there is also the overhead compartment. You will also find a universal power port and usb port right next to your seat for all your power hungry devices should you require it. Shortly after take-off, drinks were served with a meal trolley - I opted for the Champagne Canard Duchêne Cuvée Léonie Brut which is what ANA serves on-board the Business Cabin. A packet of nicely packaged rice crackers were also given during this period. It is worth nothing that on my flight from Singapore to Haneda on Singapore Airlines, passengers in the Business Cabin were all addressed by their last name (or first if you like!) but on-board the ANA, this was not the case. While the food was presented all at once as opposed to being served in separate courses, it was visually appealing but what really stood out for me was that salted grilled chicken with dried Japanese-style curry. I love the flavours and how moist the chicken was - this is exceedingly difficult on-board a flight! It is also pretty amazing to have hot miso soup served to you on the flight - same deal with having a freshly-extracted espresso shot served to you on the flight. If you intend to try the famous Ippudo ramen that is served on-board ANA's Business Class, keep in mind that this is not available on the HND to HKG flights as they are too short - it is best to check with the airlines directly forthe full food and drink menu for your intended flight. The entertainment on-board flight NH859 was pretty mediocre at best - perhaps I have been spoilt by Singapore Airlines' range of entertainment programs - I know some people actually complain about SQ's selection too but the choice on my ANA flight was seriously limited - perhaps because Donald Trump became the President of the United States and everything else on-board just paled in comparison in terms of entertainment value. The handset on ANA's 787-900 Business Cabin was also surprisingly dated - I remember these from the older SQ planes and I was a little shocked to see them on the Dreamliner. The headset provided in Business Class was also pretty basic and they were just Stereo earphones instead of noise-cancelling ones. ANA does have a better Sony-branded noise-cancelling headphone on First Class and longer-haul flights in Business (and Premium Economy) but unfortunately the Haneda to Hong Kong route does not utilise that. Since I got up pretty early in Tokyo to get to Haneda Airport on time, I decided to catch a wink on the flight. One of the things that I do appreciate on ANA's dreamliner is how easily you can go from a seat to a flatbed - you do not even require an aircrew to assist you with this transition (unlike the flatbeds on-board Singapore Airlines). There are also a number of seat control buttons (e.g. one that controls the position of the lower back of your seat) that will make your flight a little more comfortable. If you prefer not to be disturbed during your flight, you may also push the Do Not Disturb button and the aircrew will not bother you during meal service - you still need to put your seat upright prior to landing though! The flatbed on-board ANA's Business Class was pretty impressive - as I have mentioned earlier, the longer pitch (62) allows for travellers to have more leg room and the ease of conversion encourages travellers to rest even on shorter flights. I managed to clock in an hour of solid rest (which is decent since the flight time is only around 4 hours) before I had to put my seat back to its original position in preparation for landing. On the whole the ANA Business Class is a pretty solid product on the 787. I personally enjoy the staggered seats and the large table but the narrower seat width is not that great for me personally and i think it matters on longer-haul flights. The food that was served on-board was pretty good and the staff were all quite nice but I do think that the personal touches (one that Singapore Airlines excel in) are slightly lacking - I am not sure if it is due to a language barrier or just a general difference in service standards so I guess the only way to find out is to probably plan another trip back to Japan soon (and hopefully on a long-haul flight that serves Ippudo ramen as a snack between meal periods). To get from Singapore to Hanoi earlier this month, I decided to travel on Vietnam Airlines’ Business Class product for a number of reasons - it departs from Terminal 4 of Singapore Changi Airport (where the Blossom – SATS & Plaza Premium Lounge is) and more importantly, I have not actually flown on Vietnam Airlines before. Additionally, I wanted to make full use of a stopover on a Singapore Airlines redemption (before the new redemption rates kicked in) so I needed to position myself in Zone 3 first. Check out my review of Vietnam Airlines’ Business Class product. My flight from Shanghai to Singapore was on a relatively new plane (9V-SKU) and as you would imagine, the Business Class cabin features the new cabin products. The Business Class seats have 55" of seat pitch and 30" of seat width - this is fairly similar to what the previous Business Class product on the A380-800 offers but strangely enough, I know a handful of people who actually prefer the previous product for sleeping. Read more about my Business Class experience now! By switching to Qantas, I was able to travel in a 2-2-2 cabin (which is not great but probably better than Emirates’ 2-3-2 layout) and more importantly, I managed to cut my layover in Melbourne Airport down to 6 hours from 13 hours. The A380 Business Class product on Qantas is probably one of the most lacklustre cabin products that I have ever taken. I recently traveled on flight SQ828 to Shanghai from Singapore and it was operated on a 777-300ER. The Business Class cabin has been retrofitted with the 2013 J products and the flight was wonderful! Emirates is my carrier of choice in 2018 and that is mainly due to the fact that their Business Class fares are a lot more affordable than say, Singapore Airlines and also because the product itself is quite good. I have only quite recently obtained MVP Gold status (which gives me 100% bonus miles on eligible flights) on the Alaska Airlines Mileage Plan program by crediting all my business class flights on Emirates (and then some) towards it. This is the final segment for my flight from New York back to Singapore (via Dubai) and it may be long overdue but I thought it might be interesting to people who are curious about the 777-300ER product on Emirates. When I visited Tokyo back in May, I travelled back to Singapore on Japan Airlines - I have been flying JAL rather frequently (this was my fourth Business Class flight) this year since it costs a lot less to redeem my miles on it than on Singapore Airlines. More importantly, I have found the food served in Business Class on day flights to be comparatively better than Singapore Airlines (if you are picking the Japanese meal). Read about my Business Class experience on Japan Airlines from Tokyo back to Singapore! While I typically do advocate the use of airline miles for Business Class and First Class flights, I managed to snag up a pretty good deal on KLM Business Class flights for me to take my family down to Bali for a long weekend. On this trip, I booked the Business Class tickets for approximately S$500 per passenger (return-ticket) which is only a fraction of what Singapore Airlines charges (read about my Business Class experience from Singapore to Bali on Singapore Airlines here!) so that to me is a great deal! Check out my first experience with KLM’s Business Class product! After traveling from Orlando to New York, I connected in John F. Kennedy International Airport (JFK) and made my way from Terminal 2 to Terminal 4. My previous flight was on Delta Air Lines First Class but since the airline does not have any interline agreement with Emirates, I had to collect my luggage in Terminal 2 before lugging my bags to Terminal 4 to check-in for my Emirates flight from New York to Dubai. Read about my Business Class experience on Emirates from New York to Dubai!